Russell Clark emerged onto the New Zealand art scene in the 1930s: a multidisciplinary artist whose approach to modernism distinguished itself by virtue of a bold and unassuming authenticity. Close to a century after he first started to paint, the importance of Clark's work endures. 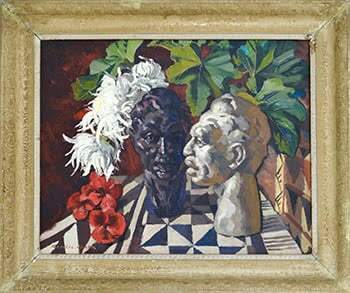 In the case of Two Heads and Flowers, the fluid energy of his practice seems to hum vibrantly from within the frame. The viewer will readily perceive the artist's mastery of a number of formal concerns: light, perspective and colour are expressed to their full potential. This painting elevates the remit of the still-life tradition beyond the confines of a formal exercise exploring the question of mortality; it speaks an essential visual language that is uniquely from, and about, New Zealand. In Two Heads and Flowers, each arranged object (but most notably the heads) do not seem to be passively regarded, but to invite an exchange of dynamism.